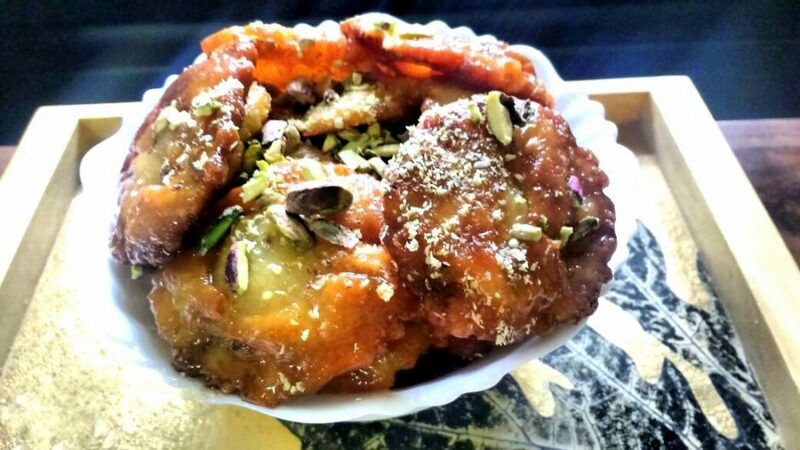 Daunting challenges like examination of your kids, headache complains, weakness, feeling tired due to study or physical activity; you will definitely go with mouthwatering delicacy and authentic Indian cuisine. Slice the cashew nut. Keep aside. Boil water along with sugar, and make sugar syrup. Keep aside. 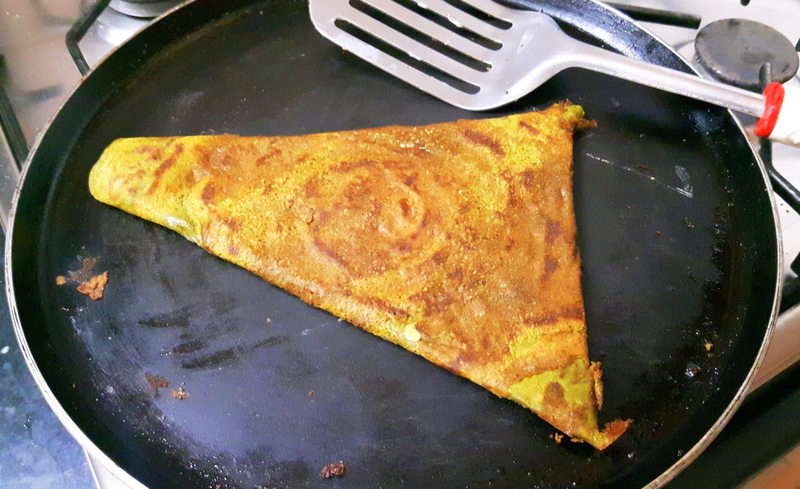 Heat ghee in a fry pan, add Aata. Roast Aata on medium low flame till it gets golden brown in color. 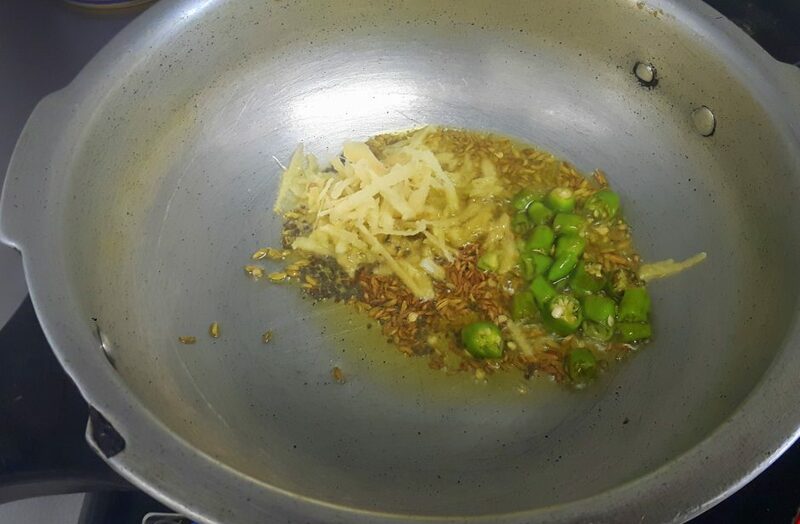 Add cashew nut and raisin in it and fry for a minute. Add sugar syrup, stir to mix well. Let it cook for 5- 8 minutes on medium low flame. 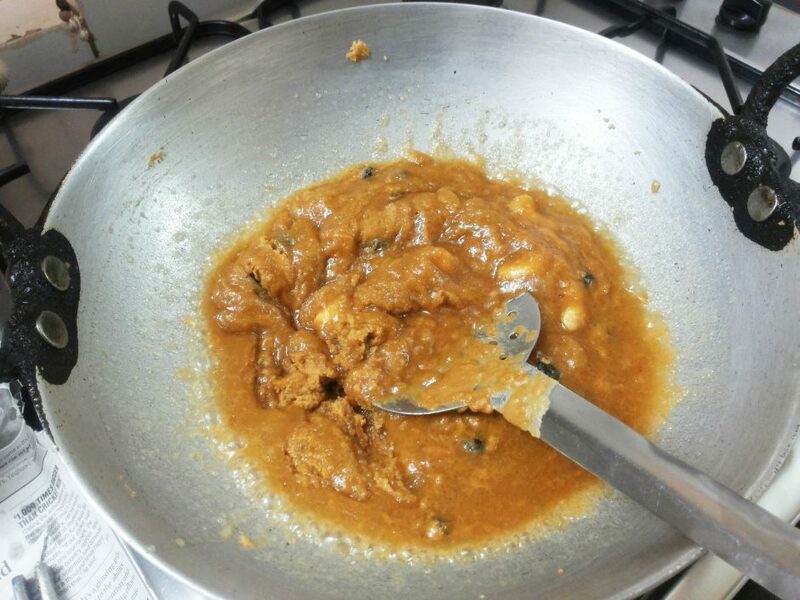 Stir it, lower the flame continue to cook till the halwa consistency come. Add cardamom powder, stir to mix well. Add one tablespoon of ghee to finish off. 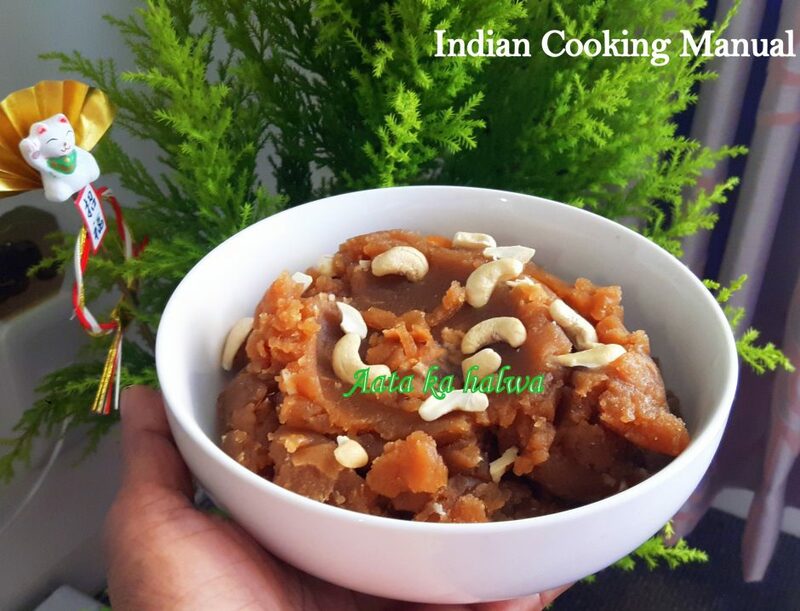 Transfer it to serving bowl and Garnish with dry fruits or as per your choice. 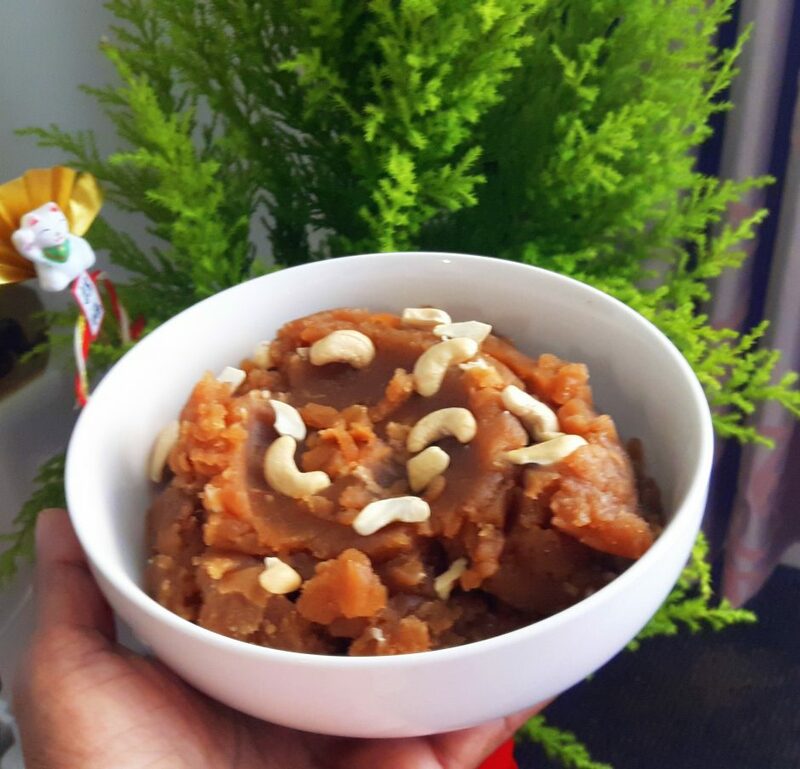 Aata ka halwa (pudding) is ready to serve. 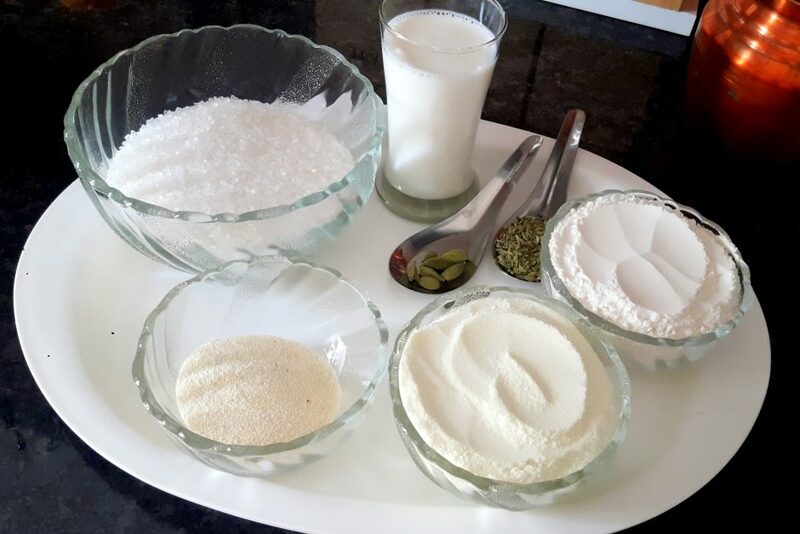 The colorful Indian festival is around the corner; so I aimed to upload today ‘Milk powder Malpua’ the recipe which is integral part of Holi fest. Khoa is not really available in Tokyo and preparing khoa is going to be slightly elaborated process, so I made the recipe with milk powder. 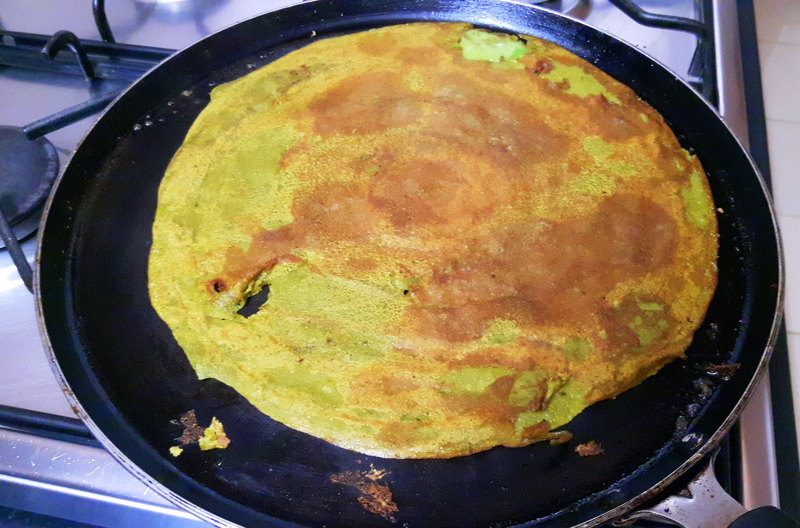 It is equally tasty as khoya malpua. 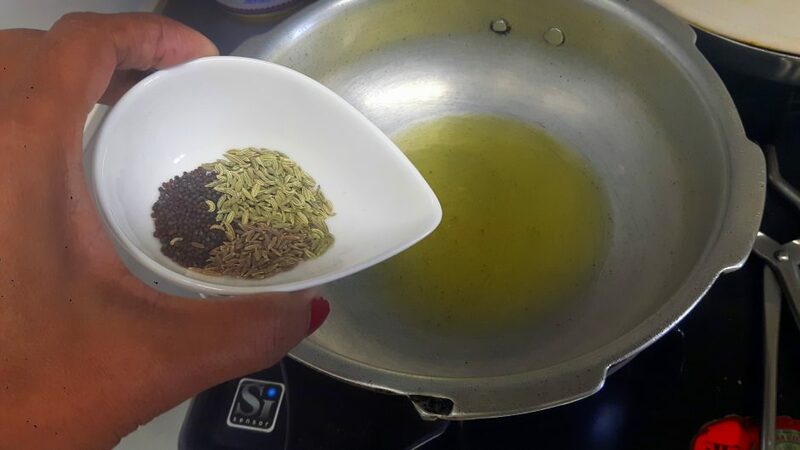 Prepare cardamom powder, keep aside. 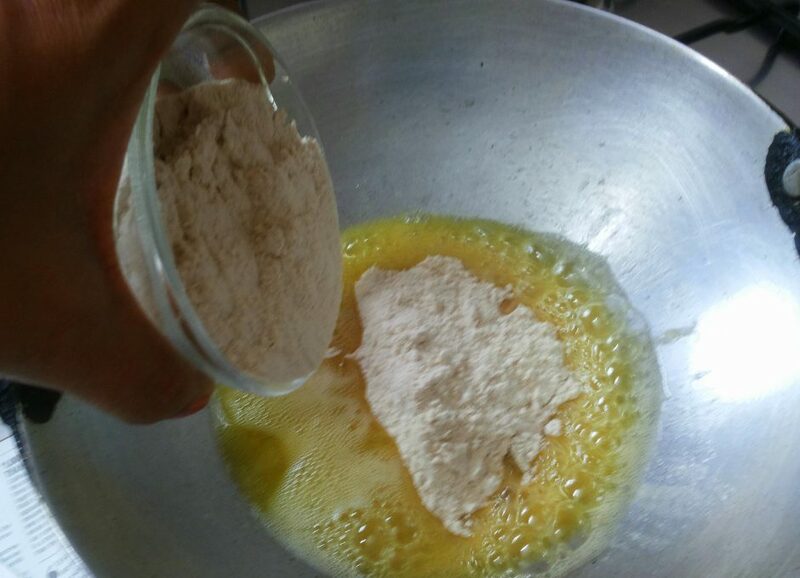 Put Maida, milk powder, Sooji, together in a big mixing bowl and make smooth batter by adding milk slowly (to avoid the lumps in the batter). 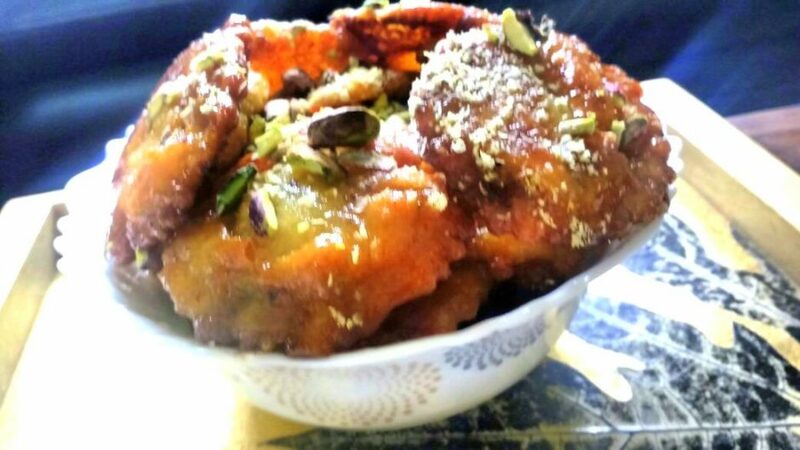 Requirement is free flowing batter not very thick not very thin; add cardamom powder and fennel seeds in the batter. Keep aside, batter to be used after an hour or two. Make one string of sugar syrup (sugar and water bring it to boil and let it cook for 3-5 minutes). 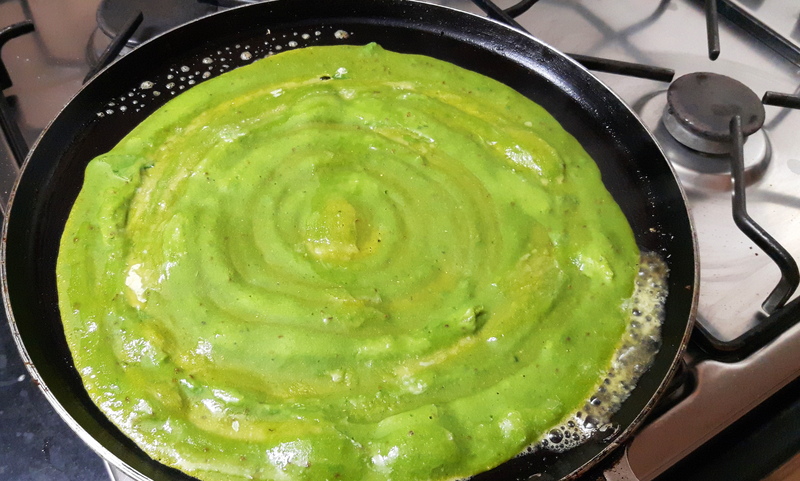 Add green cardamom powder and essence. Let it come to room temperature and it is ready. 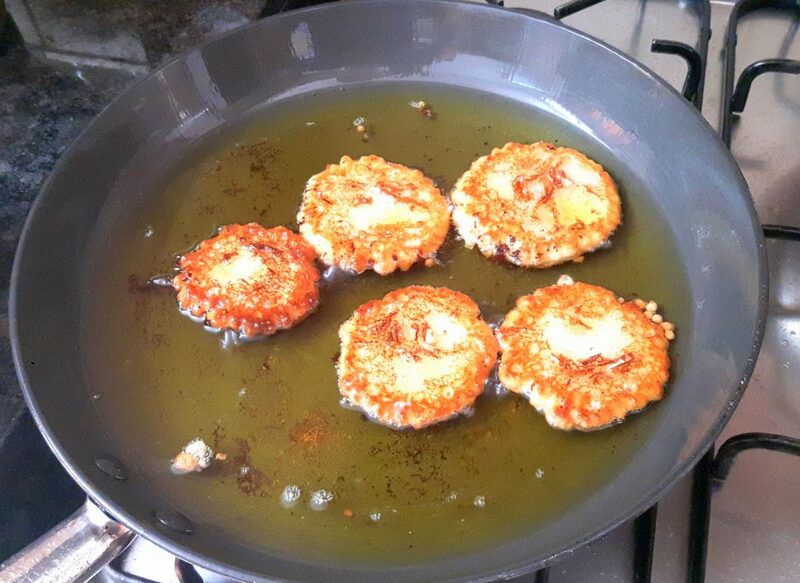 Take a flat bottom fry pan. 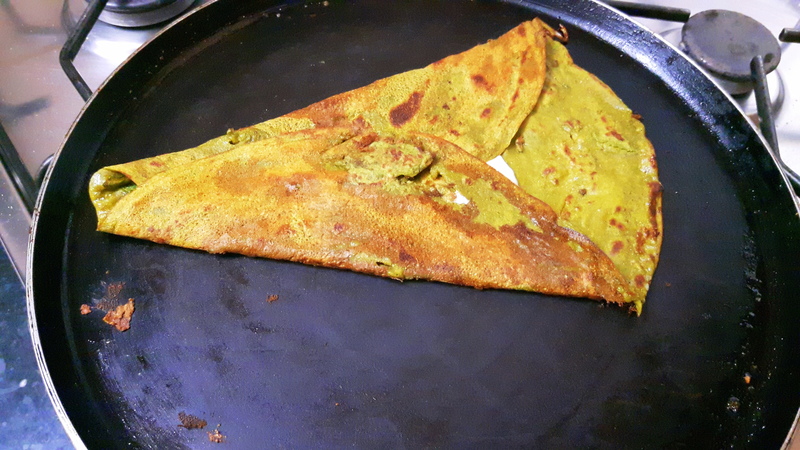 Pour sufficient ghee in it. 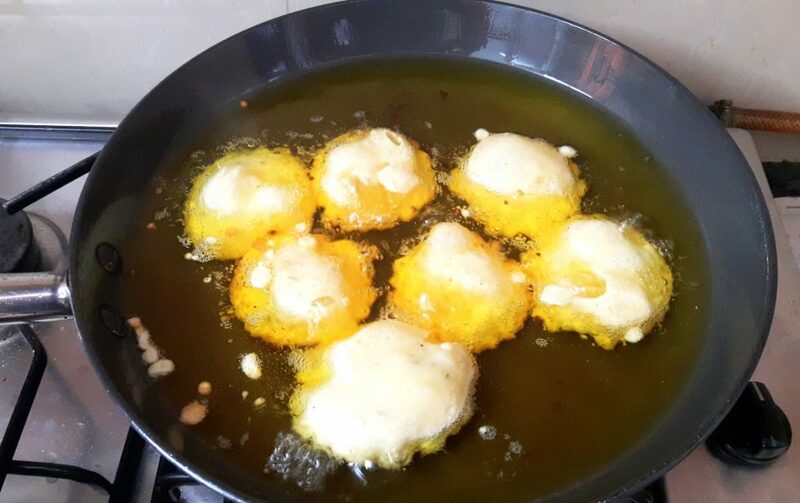 Heat the Ghee on medium flame, after five to six minutes when it is hot pour a drop of batter. 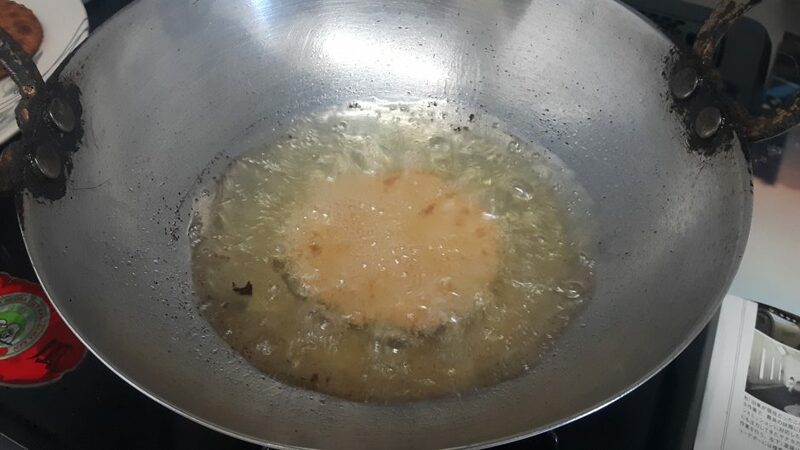 The batter should come up after few seconds, if does not; means temperature is low, allow further heating and check proper temperature by putting a drop of batter. 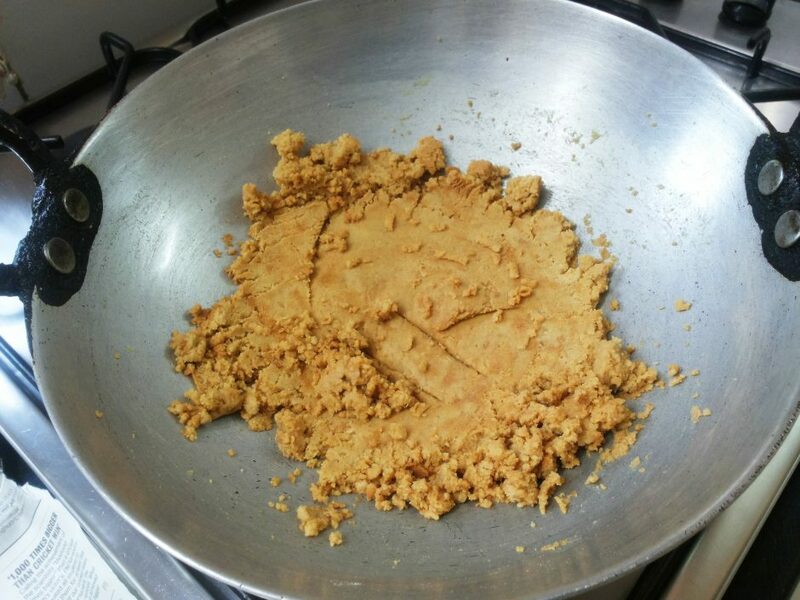 Pour a ladle full of batter to form about 3”diameter “pua”. Cook on slows to medium heat, when it starts to change color, turn-over. 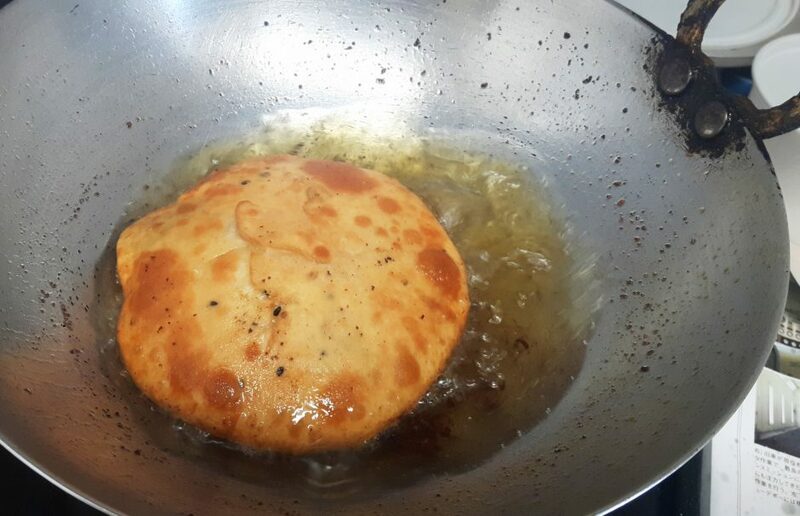 Cook till golden brown (both sides). 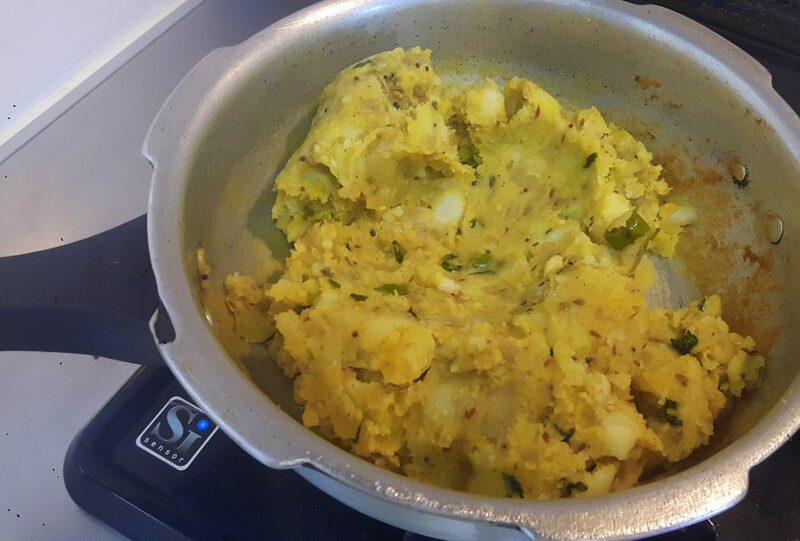 Remove from pan by pressing with two spoons to squeeze out extra ghee. 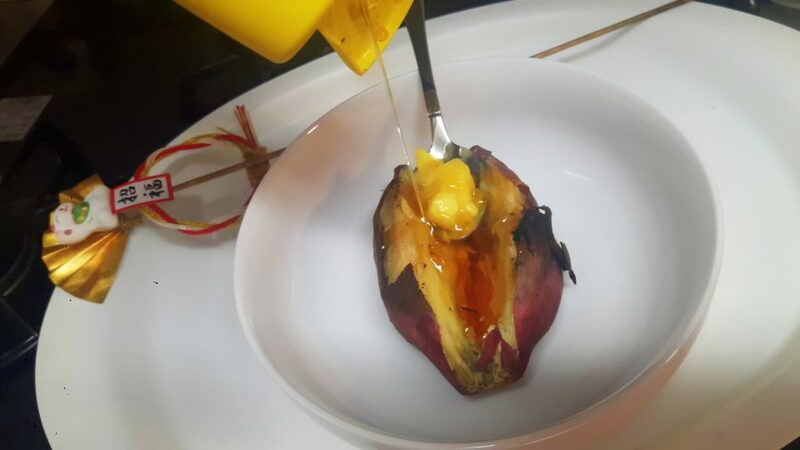 Put directly into sugar syrup, immerse into sugar syrup. 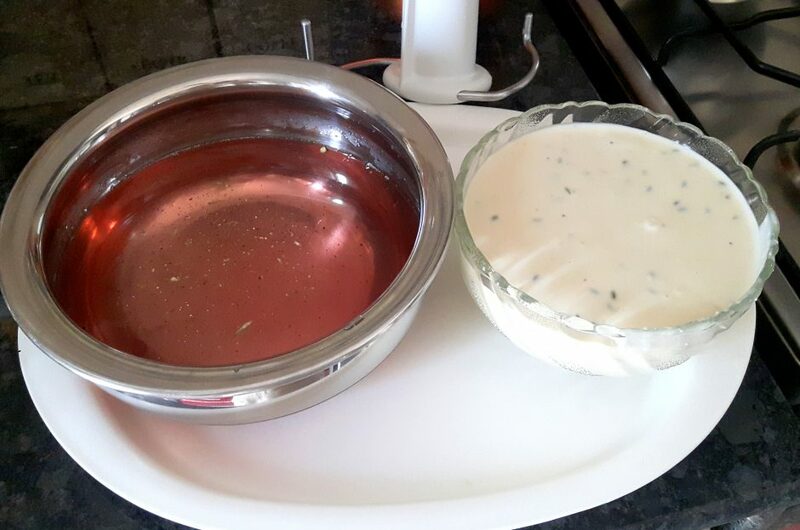 Remove after 2-3 minutes and drain on wire sieve. 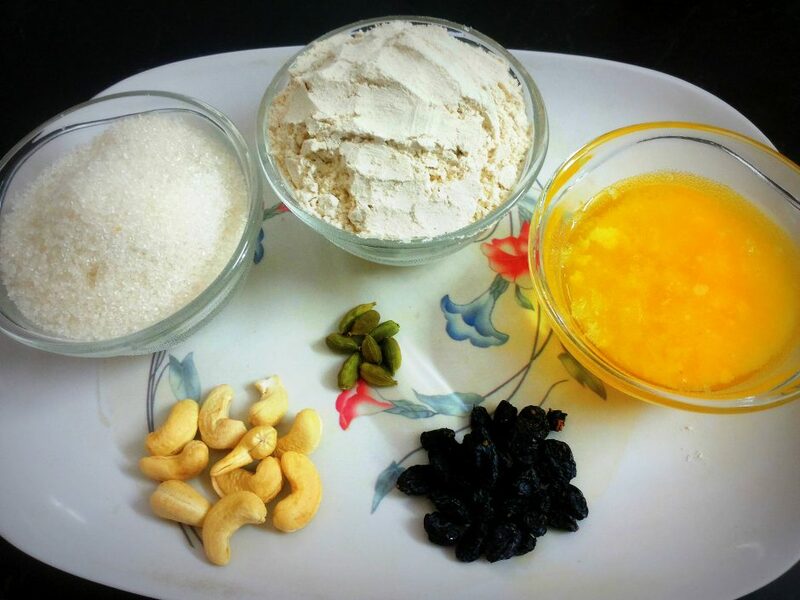 Garnish with dry fruits. 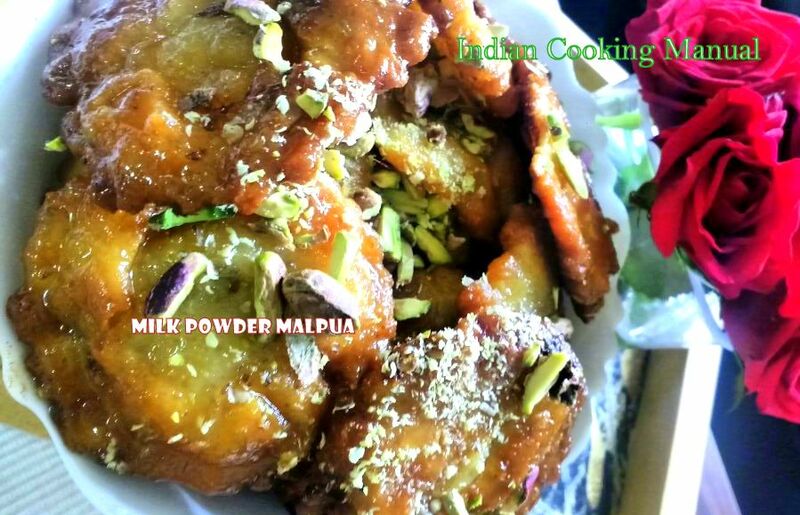 Special ‘Milk powder malpua’ is ready to serve. It was balmy winter evening when I was passing the street back home from station in Tokyo; highly pleasing delectable flavor of baking aroma was coming from a stall. 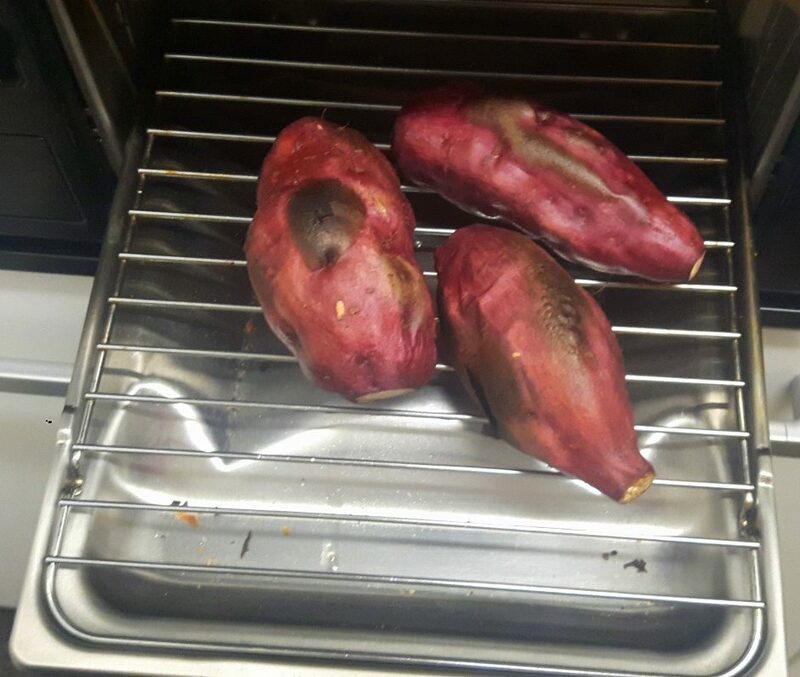 When reached near the stall, I found that sweet potatoes were being baked. 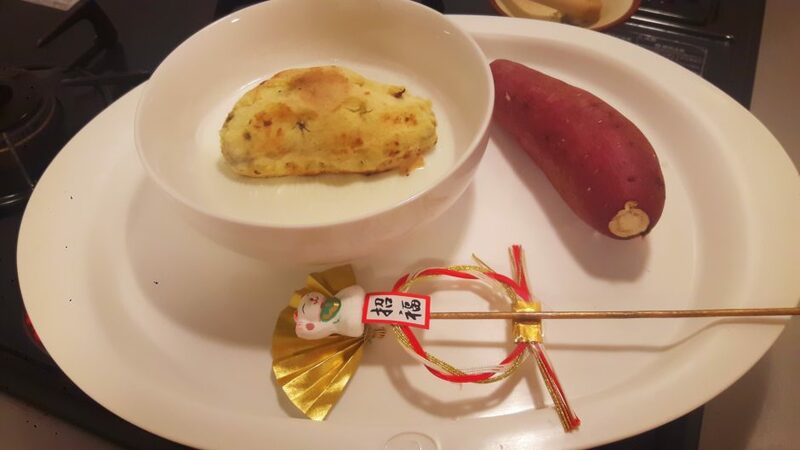 Japanese love to eat the sweet potatoes in both ways; savory and sweet. 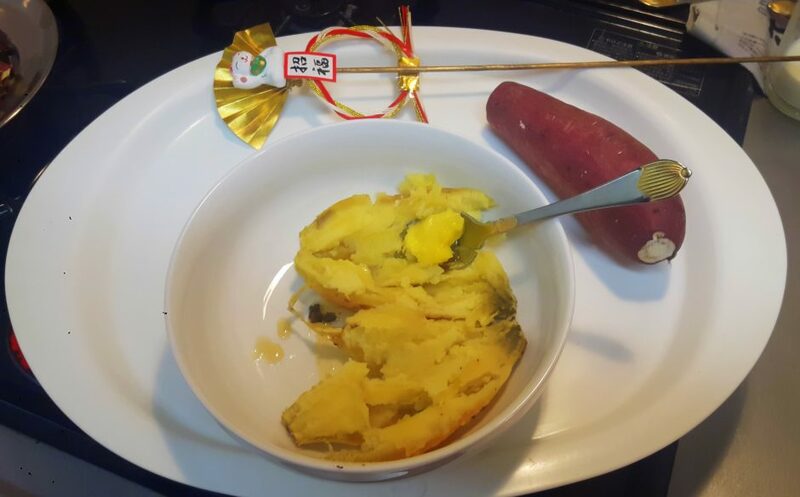 In Japan sweet potato is available almost whole year. 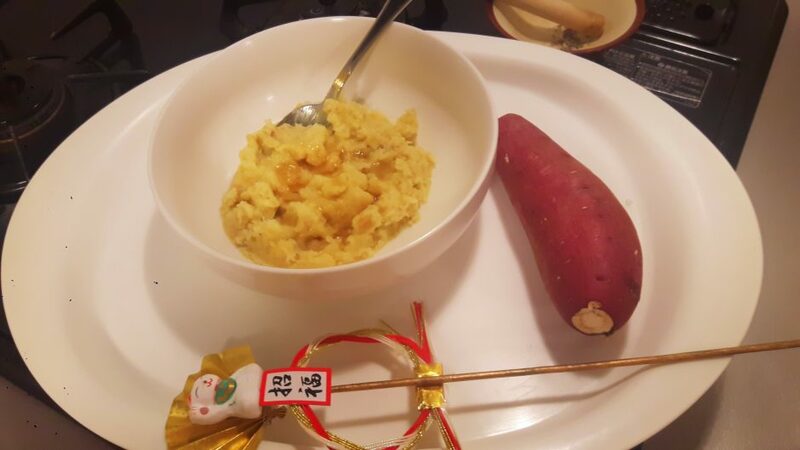 Most of the Japanese sweet potatoes variety is sweeter than Indian counterpart. 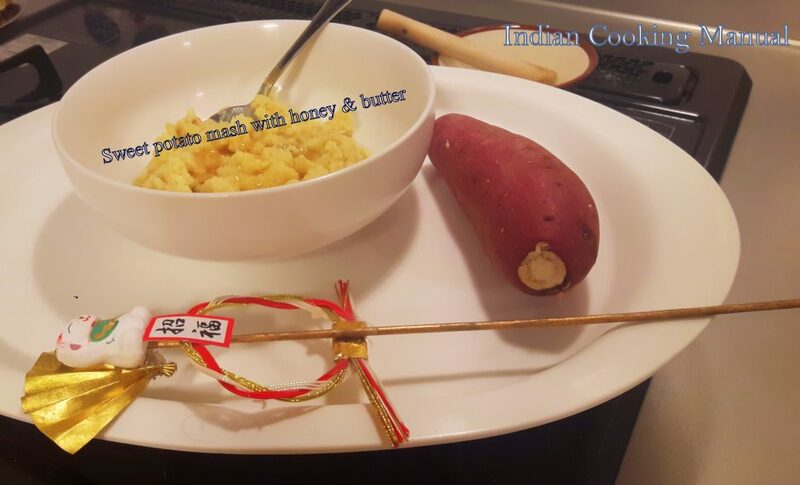 I love to eat sweet potato and my husband like to eat the recipe that I am uploading today. 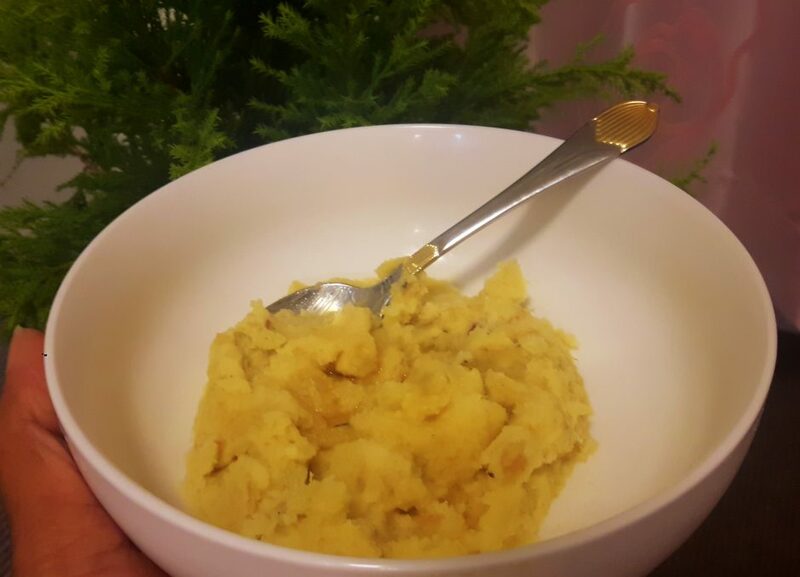 The recipe “Sweet potato mash with honey and butter” is healthy and highly nutritious for toddlers/baby. They will certainly like the taste and smooth finish of this sweet potato recipe. 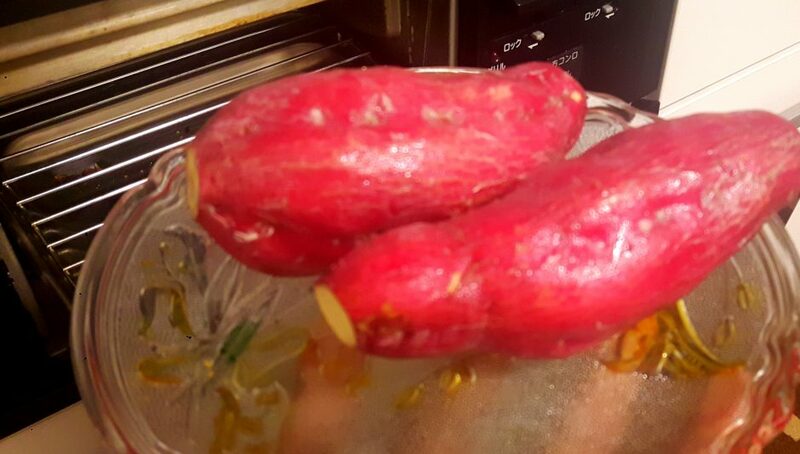 Very easy to prepare; just boil/microwave the sweet potato, peel out the skin, mash it and add some honey and dash of butter. 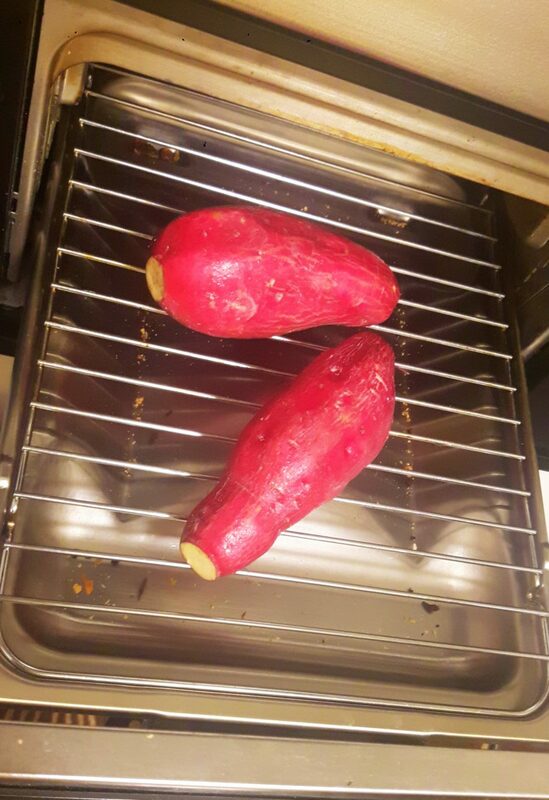 In this recipe I grilled the sweet potatoes. 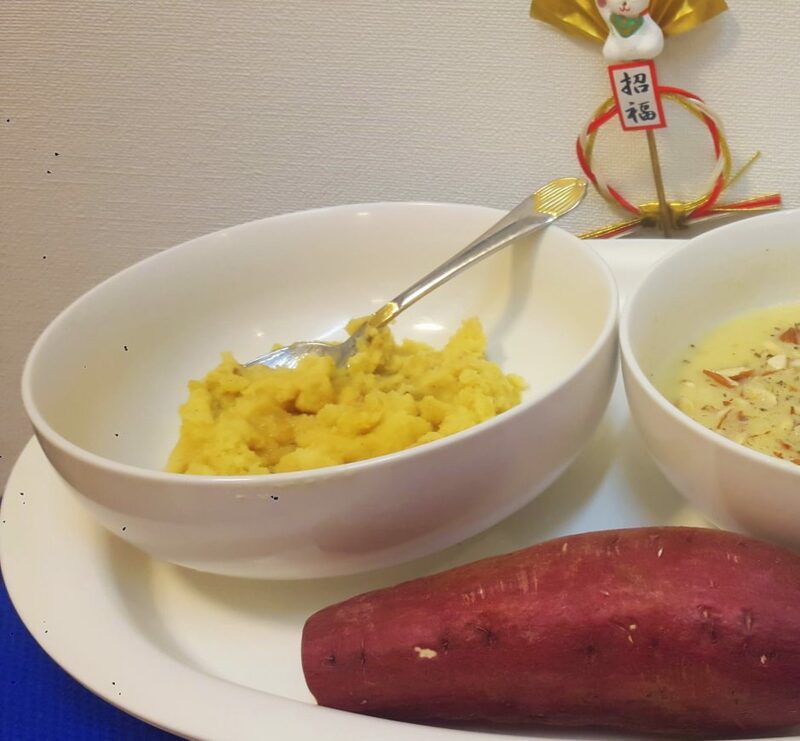 The benefits of honey, butter and sweet potatoes is good for vision and tonic for brain. 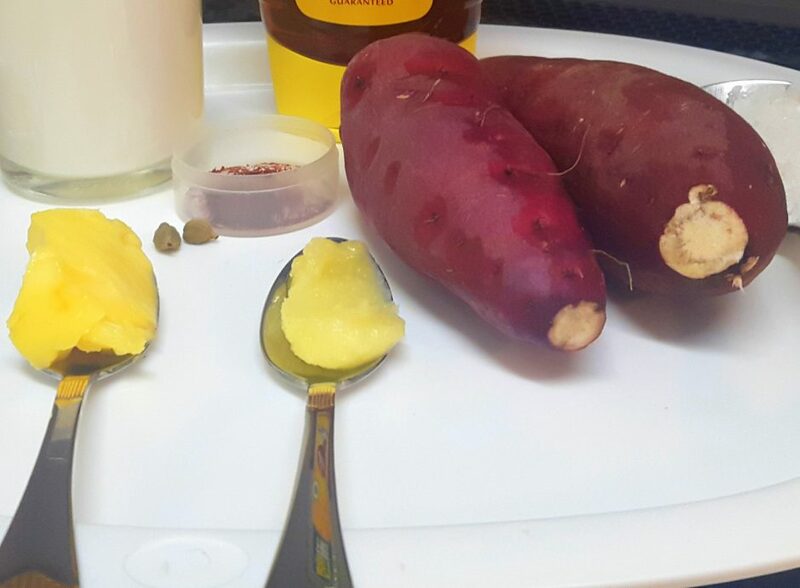 Add little butter in the sweet potatoes to increase the absorption of beta carotene in the body. 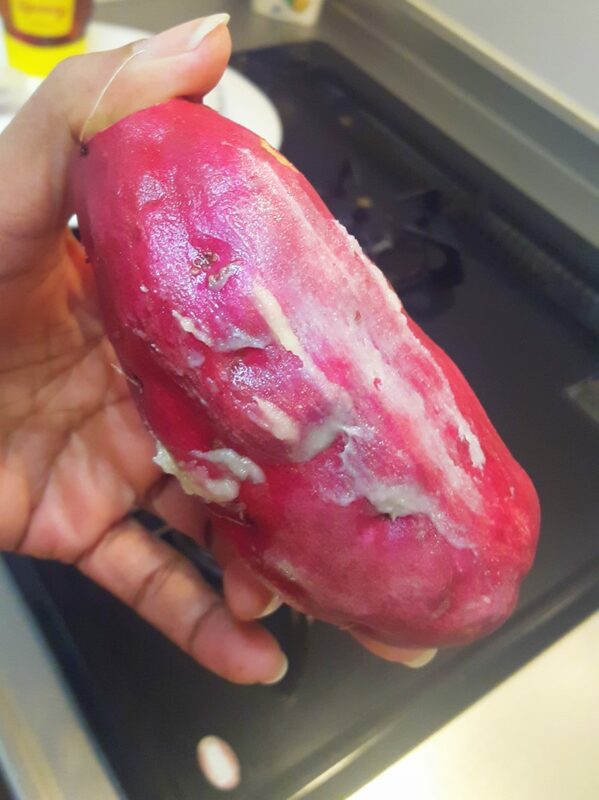 Wash and dry the sweet potato with kitchen towel, apply little quantity of ghee on the skin of it; Boil/microwave potato, keep aside. Here I used Japanese griller, which is very convenient, remove skin (outer layer) Keep aside. 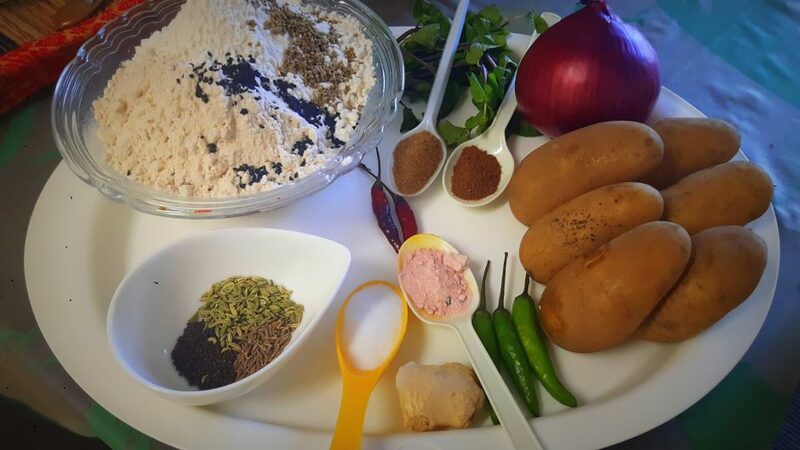 Take a mixing bowl put all ingredients into this bowl, mash all with the help of masher or hand. Mash properly more you mash better will be the taste as well easy to gulp for toddlers/baby. 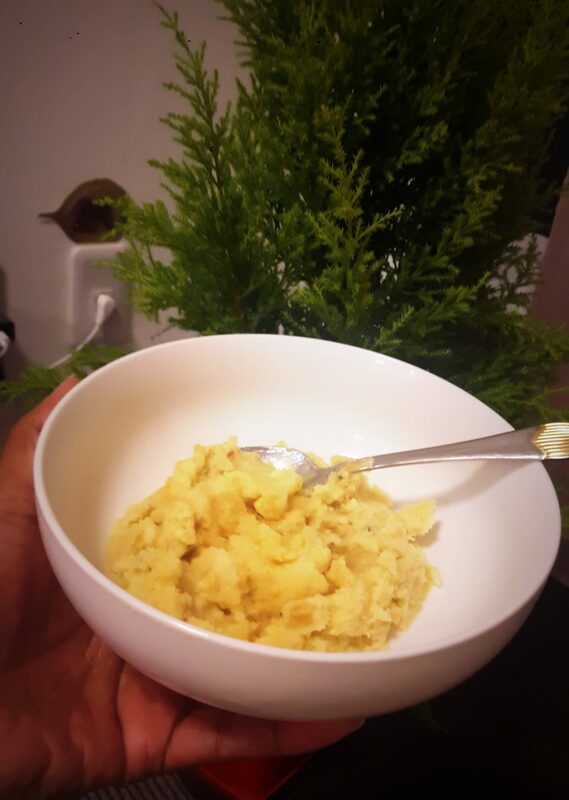 Sweet potato mash with honey and butter is ready. 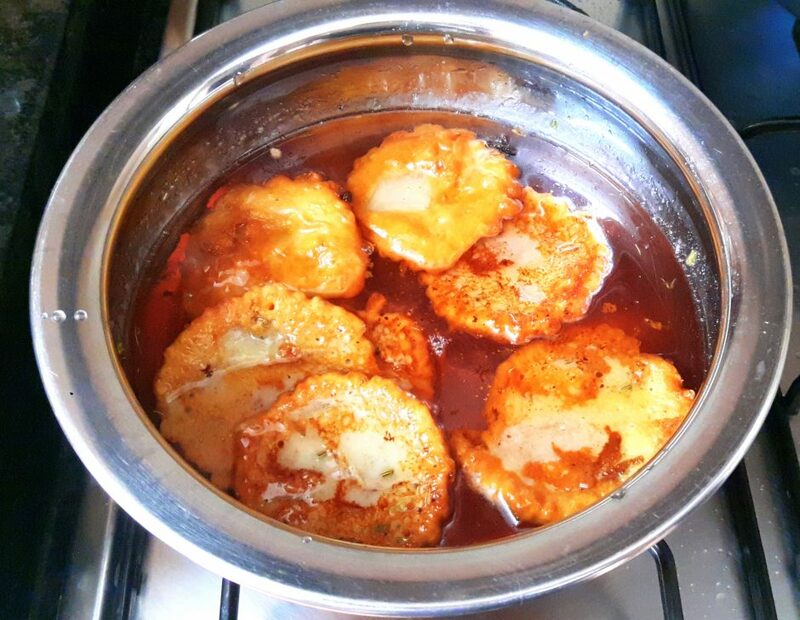 We (my family and friends) love the recipe and have a special place in our hearts… and have confidence that it will be surely liked by guests too…it happened in last month when couple of my friends visited our place for lunch. 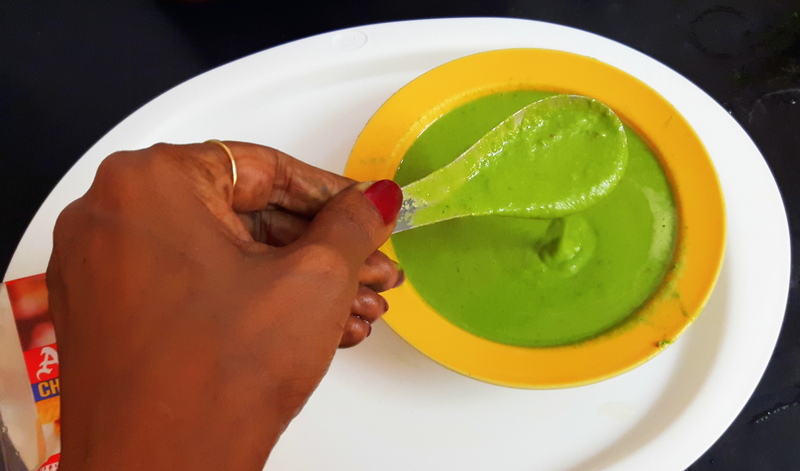 I prepared many items but they liked it so much that after their 1st bite only they told me “this recipe alone is more than sufficient”. 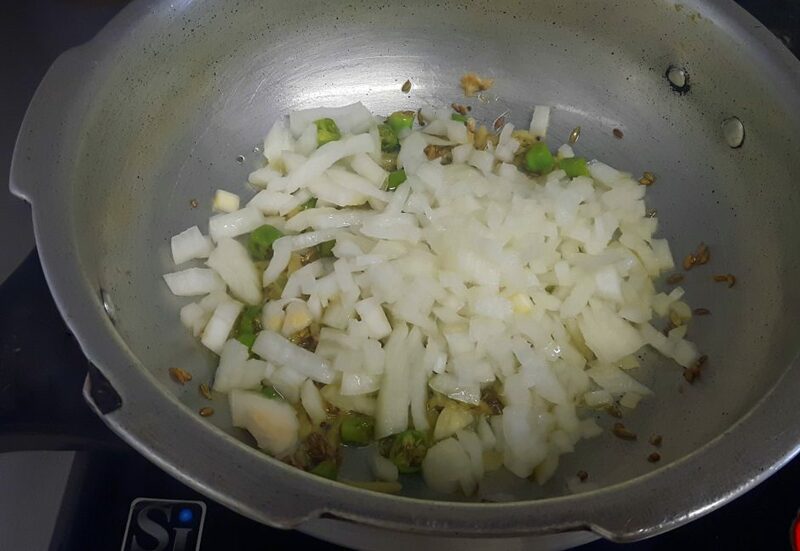 Take a wide vessel; pour Aata, Maida, 2 tablespoon ghee, onion seed, carom seed and salt. Mix well by rubbing between palms. Boil and mash potatoes, keep aside. 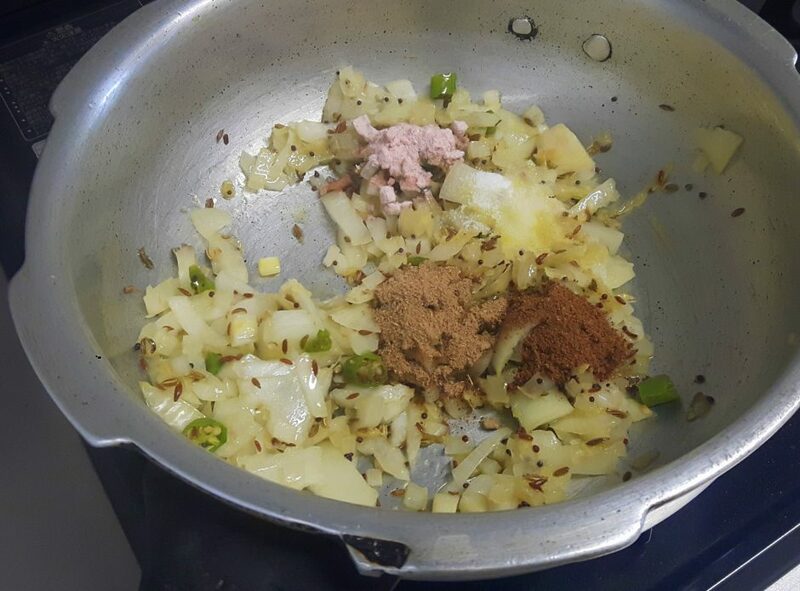 Heat 1 tablespoon of oil in a fry pan; add cumin seed, funnel seed and mustard seed, sputter for few seconds, add chopped green chili, ginger and onion. 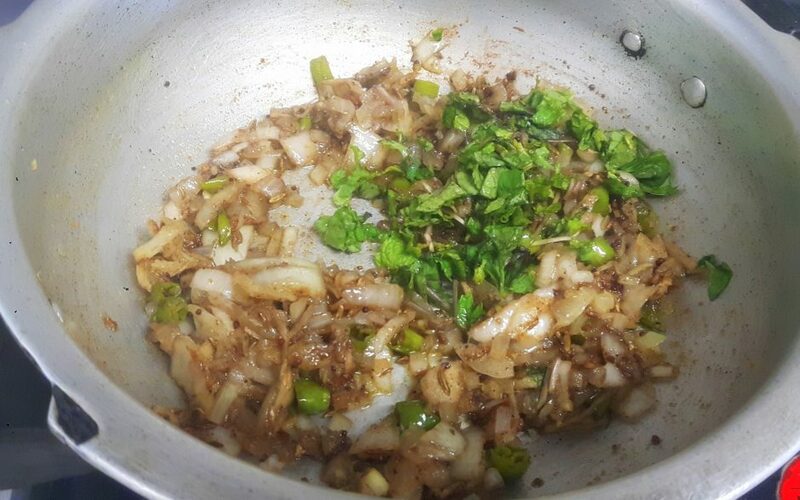 Add salt, chili powder, mint leaves, dry mango powder, Garam masala and mashed potatoes; stir fry for 4-6 minutes, Keep aside .Now stuffing is ready. Divide stuffing as well as dough into equal parts and make balls. 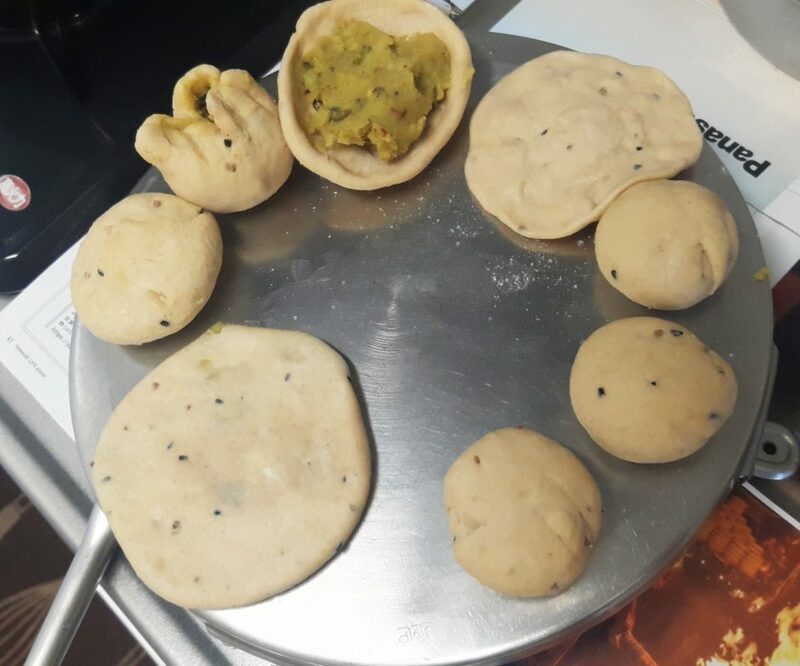 Roll the dough ball in 2-3 inch diameter circle, place stuffing ball in the centre of the circle: fold it and seal the edges by pleating and join properly: now press this ball slightly with the help of palm. 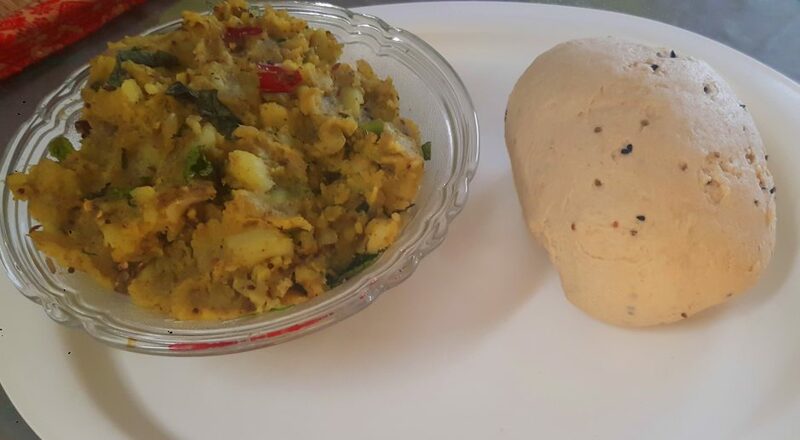 Again roll this ball into the wheat flour, roll the ball with the help of rolling pin gently, till 3-4 inch dia. 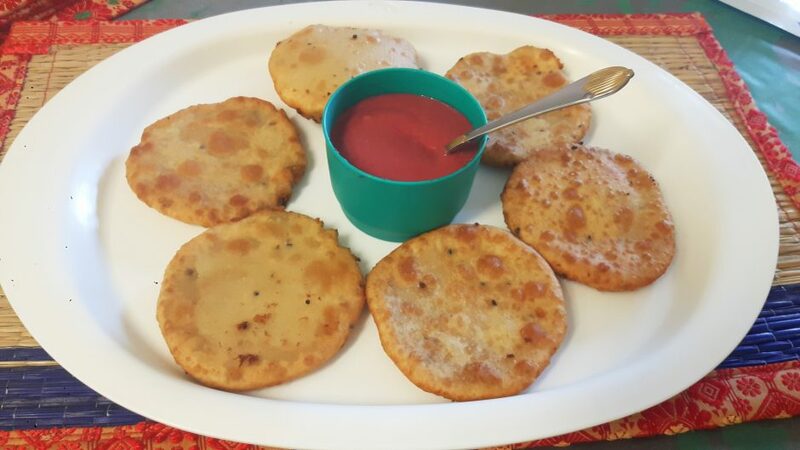 Now raw Poori is ready. Heat oil in a fry pan on maximum flame (to check if oil is ready or not, put a little piece of dough in the oil it should come up slowly). 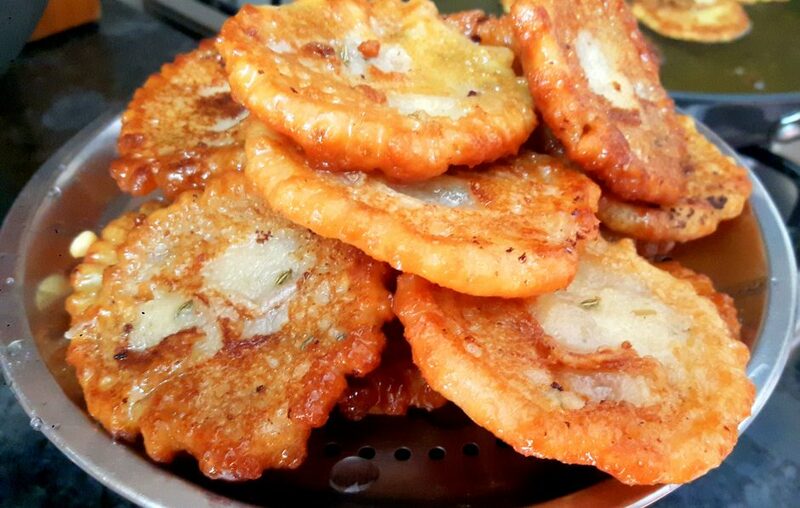 Deep fry the poories on medium flame: after they start to puff; slowly turn over, fry till it becomes golden brown. 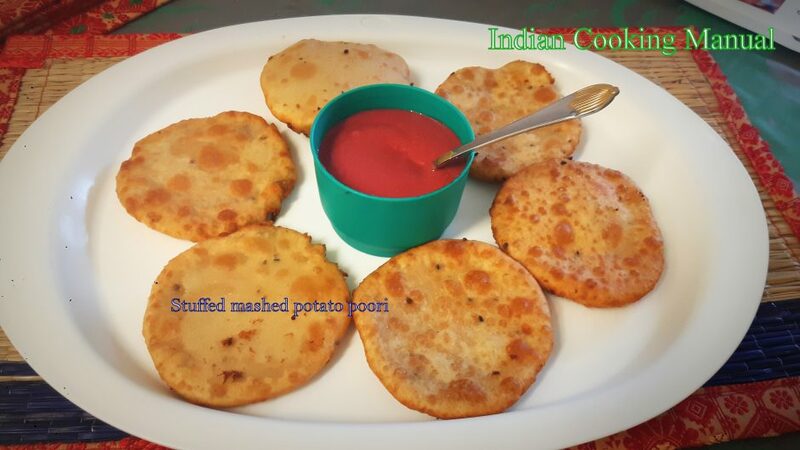 Now, mouth watering Stuffed-Aaloo Poori is ready to eat with or without chutney as you wish. 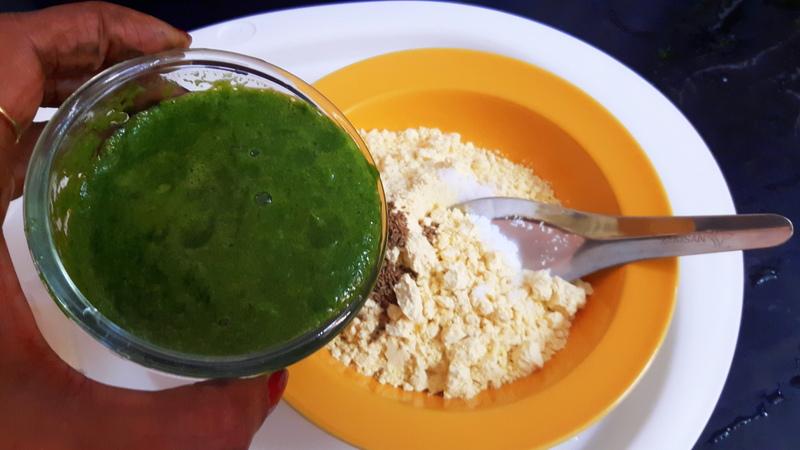 This is the favorite breakfast for health conscious & fitness enthusiast who wants to eat protein rich food and avoid eating carbohydrates, especially for those who would like to go keto diet. 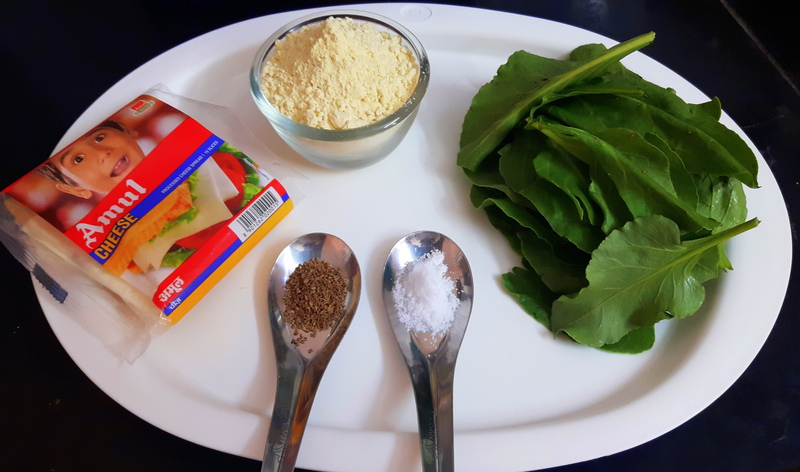 Grind spinach along with water, strain it and prepare 1 cup of spinach juice. Keep aside. 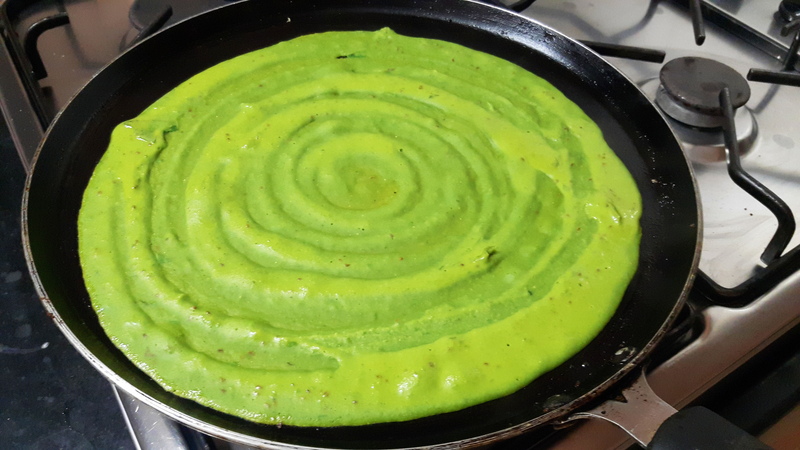 Take a mixing bowl; put Besan, spinach juice, salt, Ajawine, make a smooth paste without any lump. Keep aside. 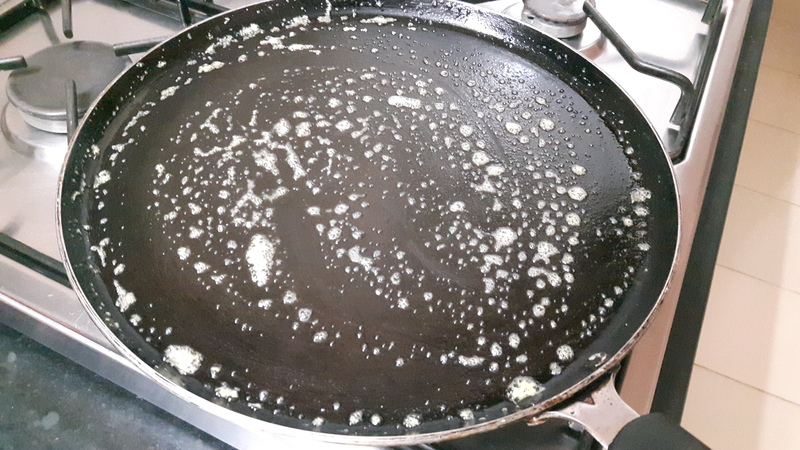 Take a non stick pan; apply one spoon of butter, grease all over on it. 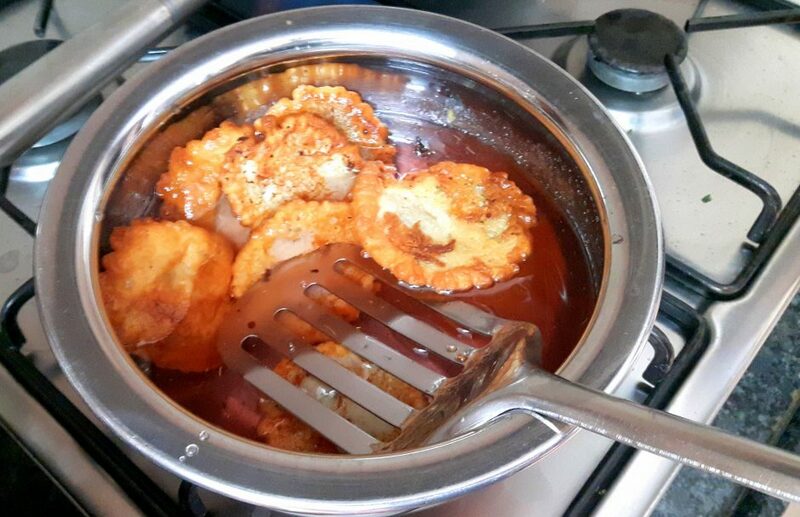 Pour ladleful of batter on the centre of the tawa and quickly spread with circular motion. 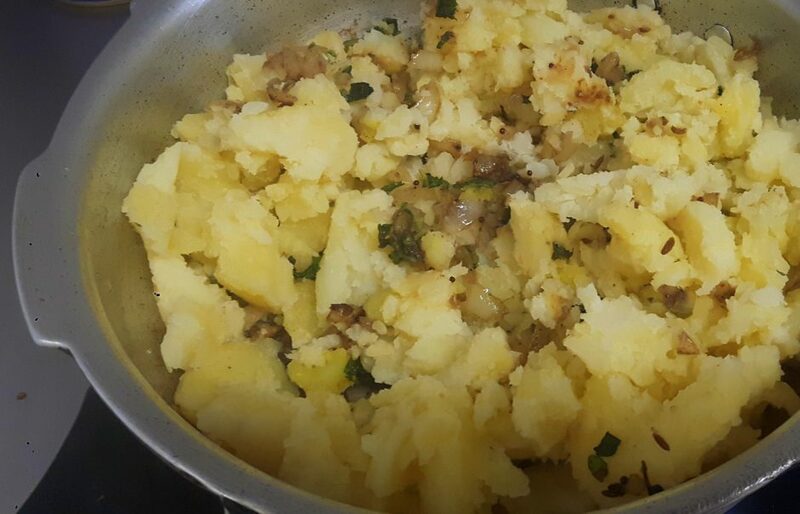 Cook from one side, spread ½ teaspoon of butter on the side and top. 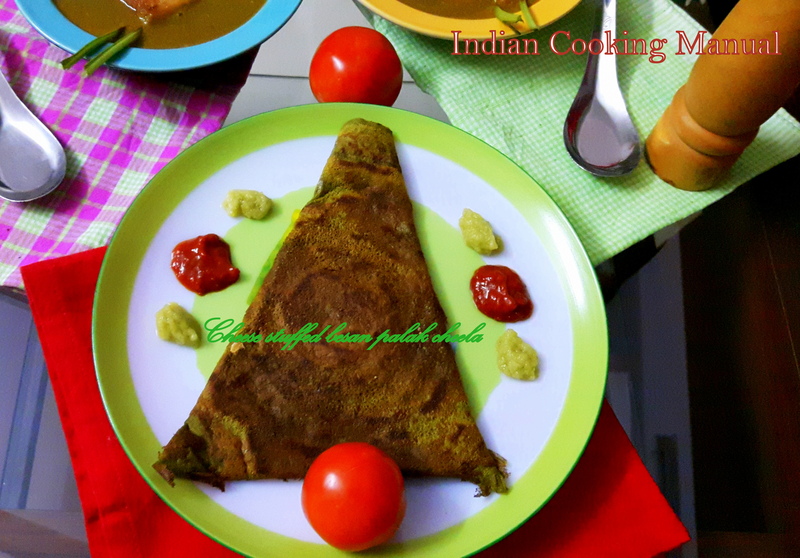 Wait for few minutes, the edges get lifted from the edge, flip it and cook both sides. 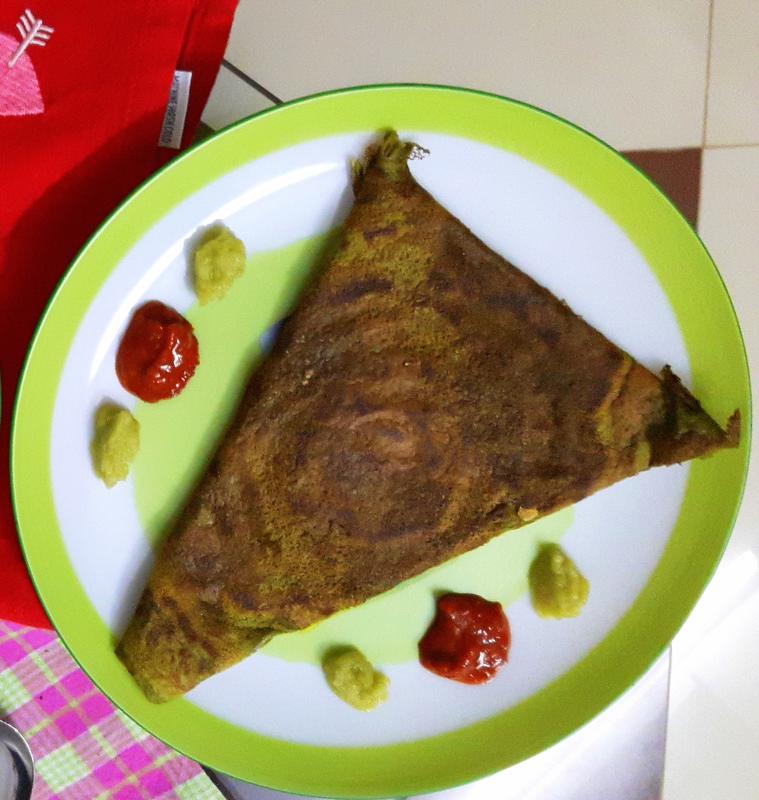 Put cheese slice and fold the cheela in triangular shape or your desirable shape as shown in the photo. 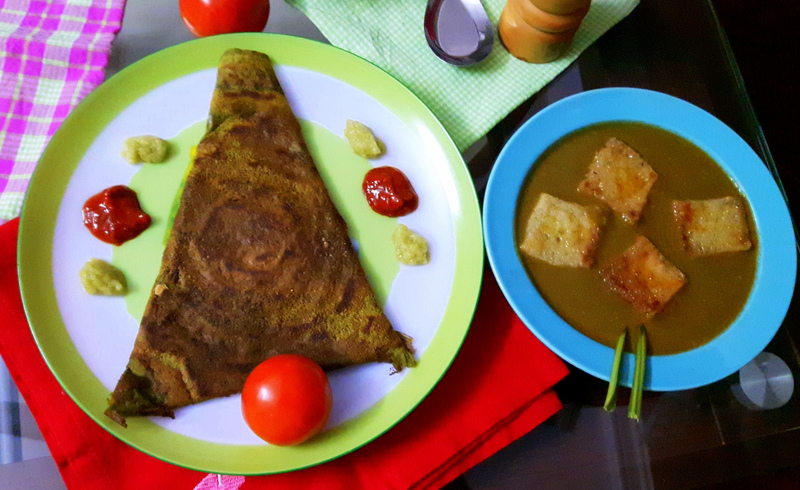 Transfer into serving plate ‘Besan palak cheela stuffed with cheese’ is ready to serve along with chutney or tomato ketchup.